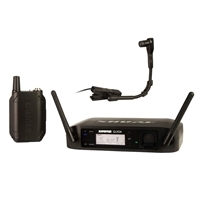 The GLX-D Instrument Digital Wireless System combines revolutionary LINKFREQ Automatic Frequency Management and battery rechargeability with unparalleled Shure design and construction and the precision-crafted Beta 98H/C flexible gooseneck microphone for brass, woodwind and percussion applications to provide exceptional digital audio clarity with seamless operation. Included: GLXD4 wireless receiver, GLXD1 bodypack transmitter, Beta 98H/C cardioid condenser instrument microphone; padded zipper case; SB902 rechargeable lithium-ion battery; USB charge cable; padded zipper case. -The Beta 98 H/C feature transformerless preamplifier circuitry which improves linearity across the full frequency range. -The pickup pattern provides high gain-before-feedback and excellent rejection of unwanted noise. -Its high maximum sound pressure level (SPL) enables it to handle the extreme demands of brass, woodwind and percussion instruments.